By Scott Gilfoid: I’ve studied many of challenger Ryan Rhodes’ fights in the past three years and I’ve come to the conclusion that he’s going to get beaten like an old rug on June 18th when he steps up a couple of levels to face WBC junior middleweight champion Saul Alvarez (31-0-1, 26 KO’s) at the Arena VFG, Guadalajara, Jalisco, Mexico. To me, Rhodes looks like a slightly more mobile version of Matthew Hatton. I don’t see much there other than teeny bit of foot and torso movement. Rhodes is still incredibly hittable, and he just looks slow, old and there to be knocked out. The power that his fellow Brits have been working up a lather about looks pretty meager to me. I don’t see much power to tell you the truth. 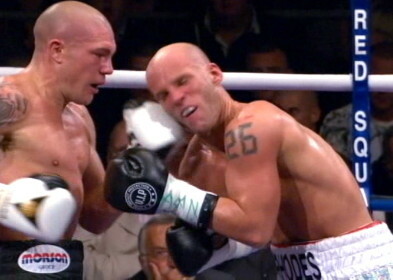 I do see a lot of easy opponents on Rhodes’ record, hence that would explain his high knockout percentage. But honestly, Rhodes looks like the equivalent of Matthew Hatton on a pair of slow, rigidity roller skates. This is going to be like taking candy from a baby for Alvarez. He’s much too strong for Rhodes and it’s going to become apparent in the first 10 seconds of the fight when Alvarez lands his first jab or right hand. It don’t much to show how much stronger Alvarez is than Rhodes. This is going to be a royal slaughter of epic proportions. I hope Rhodes can move a little better than what I saw of him in his fight against Jamie Moore because Rhodes looked painfully slow in that fight. I was stunned at how slow Rhodes was after hearing his loving, adoring British fans frothing at the mouth about how quick on his feet Rhodes was. The guy is as slow as molasses in my view. The speed just isn’t there and without speed and/or a great chin, Rhodes is going to get the stuffing beaten out of him. It’s going to be like someone dragging an old dirty rug out side, hanging it on a big fence and then knocking the living tar out of it. I almost feel sorry for Rhodes already. It’s going to be a massacre. « If Khan was willing give a 50-50 deal to Bradley, then why not Judah?